30 x 40 Poster Frame SwingFrame is the best quality, wall poster frame that swings open for rapid change of posters, graphics and other printed signage. There’s no other 30x40 poster frame display like it. The Classic Poster SwingFrame, with its hidden hinges and gravity lock, is a patented quick change frame system that features a traditional style metal frame with a decorative beveled matboard. This combination presents a classic 30" x 40" picture frame look that can fit into any interior environment; retail, corporate or institutional – all industries and markets. Snap Open 30 x 40 Picture Frame is a popular fast-changing, poster frame that allows you to effortlessly change posters and signs. All four sides of the 30x40 snap frame are spring-loaded to "snap-open". Snap poster frames also known as “poster clip frames” are easy to install to the wall. 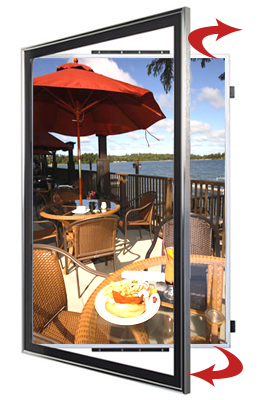 Aluminum snap frames easily snap shut and provides posters with tight, wrinkle free grip. 30 x 40 Poster snap frames are used for numerous signage applications in retail stores, corporate facilities and as point of purchase display frames. 30 x 40 Top/Side Load Frame is a wall poster frame and signage frame that allows you to drop your poster from the top or load from side. 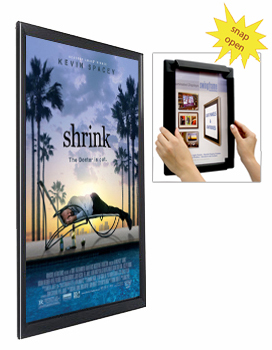 The thin 30 x 40 frame enfold the wall at only 5/8” depth and is designed with a concealed slot to quickly change your posters. Easy to use and install, this economical 30x40 top load poster frame has a 1” wide beveled metal frame profile and comes in popular black silver and gold finishes. 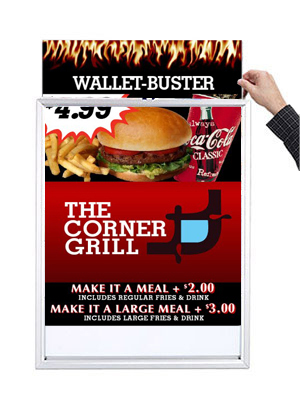 Top Load Frames accept mounted posters and signs up to 1/4” thick. For thin poster sheets a backing board and protective clear overlay are available as an option. This quick change 30" x 40" frame for posters, can also be ordered as a Side Load Frame.